All of my students can’t stop telling me about their Halloween costumes! I’m not sure I’m ready to even think about what I’ll dress up as but if these kids are so excited about this holiday so we might as well jump on the band wagon and bring some Halloween fun into lessons right? Today we’re sharing a quick improv activity with a ghostly sound. 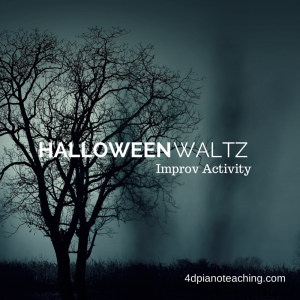 Our activity is titled “Halloween Waltz” so review 3/4 time and e minor position before you begin to rock out with your students. I love sending students home with the sound in mind after an improv activity and hearing their own creations the next week. Hope this gets your studio composing this Halloween season! Join our mailing list to get a free ebook and receive weekly updates.